Do alternative therapies really work? There’s a lot of buzz around complementary medicine, but how do you know which ones are really effective? What it is: Part of Traditional Chinese Medicine (TCM), acupuncture is the oldest – it’s over 5,000 years old – and most widely used form of medicine. Acupuncture uses thin, sterile stainless steel needles on the body’s 365 acupuncture points to treat a specific health issue or body part. How it claims to work: When the balance between Yin and Yang is lost, the body can’t function properly and becomes prone to sickness. By inserting thin needles into the surface of the skin, blood circulation is stimulated and energy, or ‘Qi’ is allowed to flow again to fight off illness. Acupuncture can be uncomfortable – after all you are being pricked and prodded by needles – but when done properly, it should be bearable. What it’s good for: A report from the World Health Organisation concluded that acupuncture is an effective treatment for neck, low back and knee pain, nausea and vomiting, headache, depression, and arthritis as well as pregnancy-related issues. TongRen Tang offers more than 70 traditional Chinese medicinal products and services ranging from acupuncture and Tui Na to Moxibustion and Remedial Massage. 04-3497888; www.trtgulf.com. Chaslu Wellbeing Centre offers a range of TCM treatments, including acupuncture and herbal remedies. 04-395 5799; www.chasludubai.ae. What it is: This ancient Japanese healing art is an energy healing technique that draws on the body’s own power to release blockages that are hindering a person’s ability to heal, both physically and emotionally. How it claims to work: Reiki is also based on the life force – the ‘Ki’. When disturbed – for example by negative thoughts and feelings – the levels of the life force become jammed up and the physical body and mind are affected. 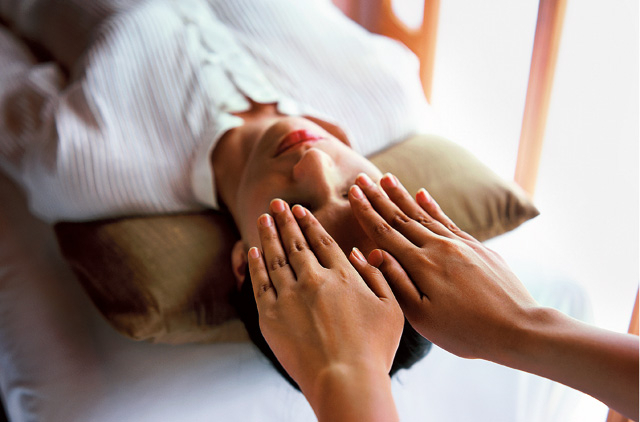 During a reiki session, a therapist runs his hands over the body to identify blockages. By placing the hands over the affected area, he acts as a conduit of the universal life force to release energy back to you. During the process you might feel a slight tingling or warm sensation throughout the body, but it’s completely painless and will leave you feeling physically and emotionally rejuvenated. A basic level of reiki can also be learned by undertaking a short course, after which you can use it on yourself. What it’s good for: To some the concept of energy therapy might sound downright silly. That said, energy medicine has been successfully practised for thousands of years and casual evidence suggests it is helpful in relieving minor ailments, such as skin conditions, digestive discomfort, aches and pains, and certainly, stress. Reiki Touch Dubai is a centre dedicated to the art of reiki. Spadunya Club specialises in holistic wellness, including r eiki. What it is: During this form of deep relaxation, the unconscious mind responds to positive suggestion to bring about changes in your personal and professional life. How it claims to work: Under hypnosis, patients become much more focused and concentrated. They can then use their minds more powerfully – via imagery for example – to change their thought and behaviour patterns. For example, if you’re forever losing the battle of the bulge, hypnotherapy can help you to address the underlying reasons for your overeating, such as identifying emotional eating triggers, boosting low self-esteem, or learning to manage stress. What it’s good for: There’s solid evidence that hypnotherapy can help people quit smoking for good, sometimes in as little as one session! Hypnotherapy has also proven successful in helping to treat a wide range of other issues, from IBS and insomnia, to boosting self-confidence and overcoming fears and phobias. Hypnotherapy The Solution is run by Sylvie Rossetto, a certified hypnotherapist from the California Hypnosis Institute of India and offers regular free introductions to hypnotherapy. 050-5518671; www.hypnotherapythesolution.com. What it is: According to reflexology wisdom, all of our organs are connected through nerves to our feet. Therefore, physical ailments in those organs can be healed by applying various amounts of pressure to reflex points on the feet using the thumb, knuckle and hands. How it claims to work: A reflexology massage is not for the faint hearted. Based on the premise that bad blood flow equals bad health, deep pressure is applied to the blocked or congested areas to re-activate energy. If a certain part of your foot hurts during the massage, that indicates which part of your body has problems. The pain lasts only as long as the therapist presses on the point and can range from ‘that good kind of pain’ to barely bearable. You can take solace in the fact that once the session over, you’ll feel as if you’re walking on sunshine. What it’s good for: Research has shown reflexology to be effective in reducing stress and tension, improving circulation, lowering blood pressure and alleviating pain, such as backache. The Holistic Institute offers training, but not treatments – 04-4503525, www.theholisticinstitute.org. What it is: This TCM treatment uses manual techniques such as rolling, pressing, pushing and pulling to address specific problems such as lubricating stiff joints and re-establishing the flow of energy. How it claims to work: The therapist applies gentle to heavy force using his hands, thumbs, palms, fingers and elbows to increase blood circulation, relax muscles and tendons and re-establish energy so the body can heal itself naturally. This deep and strong therapy can be painful as tender areas, such as the lower back, shoulders and neck are the main focus of the treatment. After a session, you should feel lighter and more balanced. What it’s good for: Tui Na has been effective in treating chronic back and neck pain, migraines, sciatica, arthritis, muscle spams, constipation and stress-related tension. Dubai Herbal & Treatment Centre is a specialist centre offering a combination of allopathic and alternative medicine. 04-3351200, www.dubaihtc.com. What it is: According to the National Association for Holistic Aromatherapy, “Aromatherapy is the art and science of using naturally extracted aromatic essences from plants to balance, harmonise and promote the health of body, mind and spirit”. How it claims to work: After checking what essential oils are appropriate for you, an aromatherapist will massage the body using different strokes to help the oils penetrate the skin and do their job – utter relaxation is guaranteed! At home you can use essential oils in a massage to improve circulation, in a diffuser to release mood-boosting scents, or put a few drops in the bath to relax or detox. What it’s good for: What’s not to love about a therapy that promotes wellbeing through wonderful scents like Ylang Ylang, frankincense, bergamot and peppermint? There’s a reason people drink chamomile tea – it’s soothing and calming. But if you’re on edge, try mixing lavender, lemon and sandalwood for the ultimate stressed-busting decoction.